Bing Bang - Video Production Team Tackles "A Day In The Life"
In the spring of 2016, Bing Bang’s video production team was approached to capture a young farm family during planting season. At that time, the concept of Day in the Life hadn’t been created, but knowing the importance of telling the story of Iowa corn farmers to consumers and to their fellow Iowa Corn Growers Association members, the Bing Bang team brainstormed ways to maximize a single video shoot to create greater visibility for Iowa’s farmers, and up the storytelling ante. And so, Day in the Life was born. Understanding the power of telling a complete story, the Bing Bang crew decided to depict the day in the life from sunup to sundown of Iowa corn farmers. It is no secret Iowa’s farmers are hardworking; rising with the roosters and working well past the sun sets. These Day in the Life stories share the hard work and dedication of Iowa Corn Growers Association members, their pride in being stewards of the land as well as their vocation of feeding and fueling the world. Each Day in the Life is unique as ICGA encourages their social media communities to follow along with live social media posts produced by the Bing Bang team. At the close of each Day in the Life, Bing Bang also creates a more comprehensive, impactful story of the farm family told through the power of video. Want to get more Bing Bang for your marketing buck like our friends at Iowa Corn? 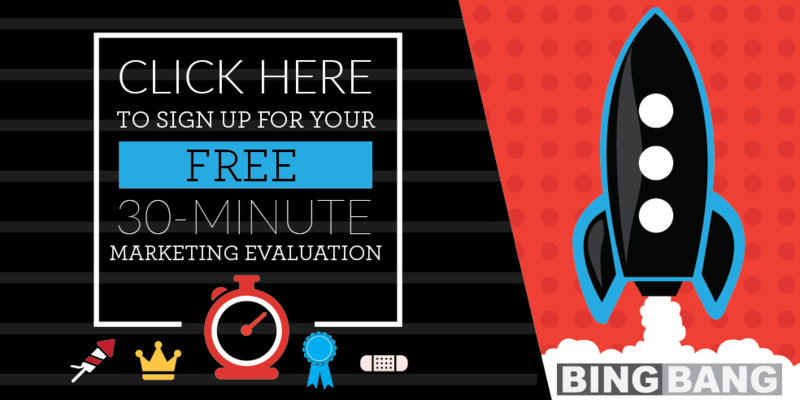 Click on the graphic below for a FREE 30-minute marketing assessment or fill out the contact form below and someone will be in contact within one business day. Want to tell your brand story Bing Bang style? Fill out the form below and we'll be in touch within one business day. © Copyright Bing Bang LLC | All Rights Reserved.